“Again and again were huzzas repeated, adding more and more every moment to the intense excitement and unprecedented enthusiasm. Every public place was soon crowded with eager seekers after the particulars of the news, and the first papers issued an hour after the appearance of the Oregon were sold by the newsboys (for as much as) five dollars each. The enthusiasm increased as the day advanced. Flags of every nation were run up on a thousand masts … , and a couple of large guns placed upon the plaza were constantly discharged. At night every public thoroughfare was crowded with the rejoicing populace. 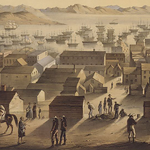 Almost every large building, all the public saloons and places of amusement were brilliantly illuminated — music from a hundred bands assisted the excitement — numerous balls and parties were hastily got up — bonfires blazed upon the hills, and rockets were incessantly thrown into the air, until the dawn of the following day. Cliff House opens — first of many! “Then there’s the Cliff House, perched on the very brink of the ocean, like a castle by the Rhine, with countless sea-lions rolling their unwieldy bulks on the rocks … Steamers and sailing craft are passing, wild fowl scream … (and) the waves roll into breakers, foam and spray, for five miles along the beach, beautiful and grand … the appetite is whetted by the drive and the breeze, the ocean’s presence wins you into a happy frame, and you can eat one of the best dinners with the hungry relish of an ostrich. 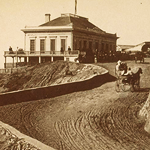 The Cliff House was exclusive because it was hard to reach — an expensive toll road and access to a horse and carriage were the only way out to Land’s End. When public transportation eventually improved in the 1880s, the toney crowd sought other playgrounds. The restaurant and its reputation fell into a steep decline, and after a 30-year run, this first San Francisco Cliff House burned right to the ground. 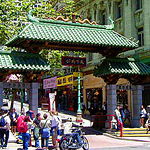 The famous gateway to Chinatown — you know the one at Bush and Grant, guarded by fou lions, and surmounted by a couple of dragons — was installed and officially dedicated. The gate is a paifang. 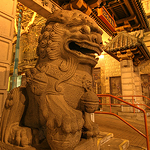 These are markers historically denoting the entrance to a building complex or town, and those evil-spirit-thwarting fou lions are a typical part of the program. Thanks largely to gifts given by the Republic of China (that’s Taiwan to you), these gates have become symbols of Chinatowns all over the world. Los Angeles, Portland, Vancouver, and countless others acquired their own neighborhood markers this way. In San Francisco’s case, Taiwan provided materials for the gate, but the design was dreamed up by Chinese-American architect Clayton Lee, whose design apparently won a contest in the late 1960s. The two-tiered, pagoda-style structure was built according to principles of feng shui, which dictate (among other things) that a city’s grandest gate must face south, and — though somewhat dwarfed by the larger buildings around it — that it does. It’s a great little story, well worth a look: “The Umbrella That Made History”. Thanks for pointing it out, Ron … I actually did link to the piece (albeit a bit obscurely) via “hail the harbinger” up above. You moved? Wow!! I hope it all went well and that you keep tied to this city with your stories. The1989 earthquke didn’t rate a mention?